Research papers on graphic communications examine the ways of communicating a message or idea through graphic representation. Graphic communications are, perhaps obviously, communicating a message or idea through graphic representation. While this appears to be a simple definition, graphic communications involve complex layers, combining color, texture, contour, shapes, and even words in order to communicate emotion, attitudes, and concepts. Graphic communications, due to the visual nature of the medium, have the ability to reach a wide ranging audience. In the modern business world, graphic communication can be used to reach potential customers. Every day, the average individual is bombarded with hundreds to thousand of such images, in advertisements, corporate logos, maps, and even how to instructions. Graphic communications have the power to communicate message with a single image, without the need for language. One of the most common examples of graphic communications is IKEA instructions. Because IKEA products are sold around the world and intentionally designed to be assembled at home by the customer, the instructions to any piece of IKEA furniture are communicated solely through imagery, and not text. Individuals wishing to study graphic communications at the university level are preparing for career in the printing industry, as well as in the more creative aspects of such communication, including advertising, marketing, and even web design. 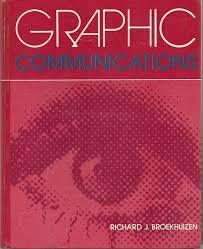 Graphic communications remains an emerging field of study and creativity. There are many arguments for and against making this a requirement for business students. All of the components of such a curriculum coincide with that of many different graduate programs in Entrepreneurship, Marketing, Art, Journalism, Communications or Computer Science. Due to the functionality and multiplicity of the uses of the graphic design, the task at hand is to determine whether or not the benefits to business students would be enough to justify possibly extending their program or replacing an existing set of courses with graphic design courses. Thus to be successful at graphic design, one must be knowledgeable about themes that are traditionally taught in Business Schools such as, marketing and packaging. To be successful in any aspect of a creative career, one must be knowledgeable about graphic design if they plan on competing using the most current, contemporary tools to display or advertise their product or service. Graphic Design has made some methods of traditional Advertising and Marketing nearly obsolete. Thus, the incorporation of Graphic Design into Business School elective courses would be an asset. Despite the creative/artistic nature of the field, there are many uses for graphic arts within the business school curriculum. Of course, we must identify where we think graphic design would be most practical. It may not be as useful in Human Resources and almost not useful in Information Science. The few areas that involve creative media and the use of visual aides and technology for the purpose of selling products would be at a disadvantage to not offer a more in depth component of graphic design to the business students. Whereas, managers may not be the one’s actually doing the graphic design, not all graduates of business school go right into the work force as managers. For those starting their own business, no matter what it is, there is a need to know certain skills that would transcend more than one department or functional area. They have to know how to sell, manage their finances, compute and even determine the layout of any marketing and advertising tools such as, brochures or a web site that will be essential to soliciting customers. It has been proven time and time again that the difference between a person who is in business and one that was in business is simply marketing and presentation. This can be seen in the difference between a flyer developed in Microsoft word and a press kit made on Photoshop, Illustrator or Quark XPress. Even if a business student has an interest in being an entrepreneur in a creative field such as, interior design or fashion, the foundation of how to manage that business is as important as the actual art that is at the forefront of the business. There may be a larger following of people with such aspirations opting for a business degree instead of one through an Art Institute but, since they have primarily been kept separate, it is beyond my scope to know how much in demand such a program would be. Of course, additional courses or tutorial sessions can be used outside of a degree program but, people do not go to business school to need more training when they get out in order to be successful at what they do. Communication Theory - Communication theory reflects a desire by theorists to develop a mathematical model that imitates and predicts language’s ability to communicate information through communication skills. Stress and the Workplace - Stress and the Workplace Research Papers delve into an order placed for a research proposal with specific sections required. Business Communication - Business Communication research papers discuss the sharing of information between people within a corporation or between a company and its customers. Communication Perspective - Communication Perspective research papers look at a sample of an order placed on looking at the world from a communication lens and how communication majors see the world different from those of other majors. Communication Skills - Communication Skills research papers look at a sample of an order placed for a business research paper on communication skills and the characteristics they should possess. Demonstrative Communication - Demonstrative Communication research papers examine the three categories of demonstrative communication: the body, one’s physiology, and nonverbal communication. Digital Media - Digital Media research papers on any communication that can be stored on a format that can be read by a computer. Effective Communication Skills - Effective Communication Skills research papers discuss the benefits of better understanding people and situations through effective communication. Interpersonal Communication - Illustrates how to develop a topic concerning interpersonal communication. Intro to Mass Communication - Research papers on an Intro to Mass Communication delve into the field of study that provides an overview of mass media in the United States, its background, role, function, effect and current issues. Organizational Communication - Organizational Communication research papers illustrate that effective organizational communication is the cornerstone of all organizations. Refine Practices of Communication - Examines communication practices across the globe. Paper Masters writes custom research papers on graphic communications examine the ways of communicating a message or idea through graphic representation.